Let’s fish today! Call Captain Joe Aiello at 1-401-623-1121 ! 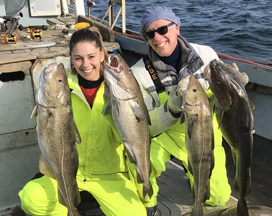 We specialize in: Family Fishing Trips, Bachelor Party Fishing Trips, Bachelorette Fishing Trips, Half-Day Fishing Charters, Striper fishing, Blackfish, Cod Fishing Trips & More! We can’t wait to hook the big ones with you and your group. Cod Trip for Capt Joe's Birthday with friend Rob Waltz - Best Birthday Cod Ever!!! Slow and steady wins the race! Pulling in a nice Striper in Newport RI! Quick pass off to a wonderful 89 year old man who handled the Striper like a pro!